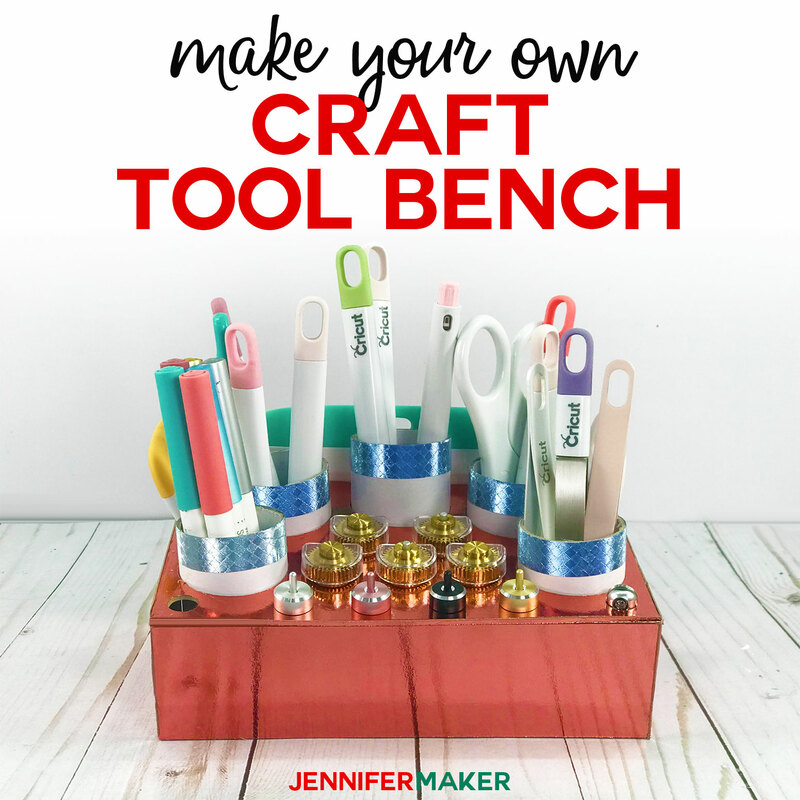 Learn how to make this sturdy craft tool bench to hold all of your Cricut tools, and then some! 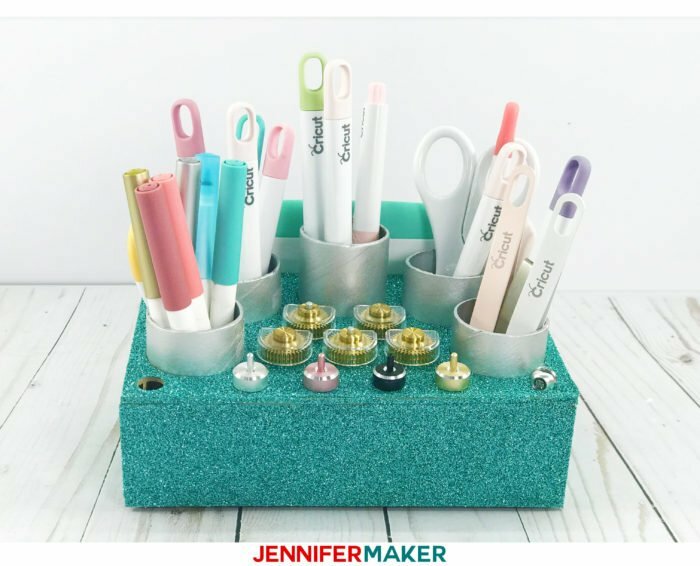 This Cricut tool holder can be made by those who have the Cricut Maker or the Cricut Explore cutting machine. When I first began sharing my craft projects with you just over two years ago, I made this very sweet and simple craft organizer. It is nothing more than a cute little basket with some paper towel tubes cut to various lengths. It literally took me five minutes, and it’s been SO useful! Well, these days I have more craft tools, especially tools for my cutting machine. I have scoring tools, scrapers, weeding tools, Cricut pens, so many! And with the Cricut Maker, I now have many different blade and tool housings as well. I was using so many of them that they weren’t even fitting in the built-in storage compartment on my Cricut. That’s when I knew it was time to make a NEW craft tool organizer: a Cricut tool holder! My Cricut Tool Bench with lots of room for all my Cricut tools and blades, and plenty of room to grow! There are spots in the front for all of the blade and tool housings, with two spots in the back a wee bit bigger to fit the new scoring tools. There are even two smaller spots on the sides for the scoring heads, as you I don’t want to lose those. Along the sides of the Cricut tool holder I’ve put in slots for my Cricut scrapers and paper edge distressers. And nice strong tubes in the middle hold all of my long tools, like my weeding tool, quilling tool, spatula, TrueControl knife, scissors, tweezers, Cricut makers, and fabric marking pens. And these tubes? They are nothing more than the leftover tubes you get when you use up a roll of Cricut vinyl! That’s right — finally a great use for those sturdy tubes. And if you haven’t used any vinyl yet, a paper towel roll tube will fit in there, too. In fact, it’s these tubes that are the secret to the stability of this Cricut Tool Bench! You see I wanted to make a tool organizer that could be made by those who had either a Cricut Maker OR a Cricut Explore, as so many of the other ones I’ve seen are just for those with a Maker. So by using these nice strong tubes to help support our Cricut tool holder, we can make this on either cutting machine. The base material you use will differ a bit. On the Maker, we’ll use heavy chipboard 2mm thick. 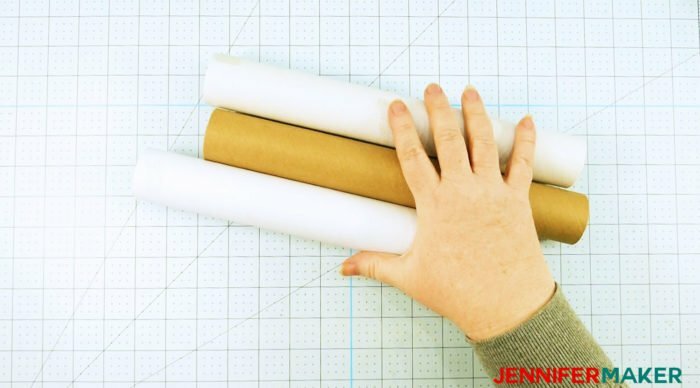 And on the Explore, we’ll use Kraft board — three layers of it. You might be able to use a thinner chipboard on your Explore as well, but it can get a little tricky and may require the deep-cut blade. But for the Kraft board, the deep-cut blade is NOT needed — just the fine-point blade that comes with your machine. In addition to your base material, you’ll need some hot glue to assemble it. And decorating is up to you! Leave it plain and simple, or add an outer layer for a little pizzazz. This pink one was made on my Explore and it has an outer layer of pink foil Kraft board. I made the blue one on my Maker and added a layer of iron on glitter vinyl to dress it up! I’ll show you how I did both! 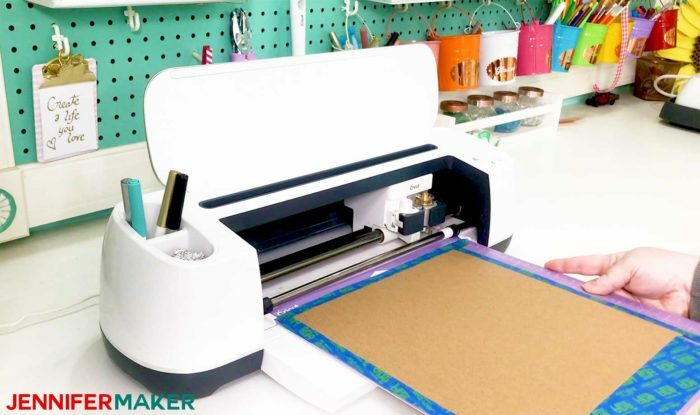 Key concepts taught in the video tutorial include what materials are best, how to upload SVG files, how to ungroup and attach, how to mirror iron-on vinyl, how to cut Kraft board and chipboard, how to put iron-on vinyl onto chipboard, and how to cover edges. Ok, let’s make a Cricut tool holder! This post contains some affiliate links for your convenience (which means if you make a purchase after clicking a link I will earn a small commission but it won’t cost you a penny more)! Read my full disclosure policy. 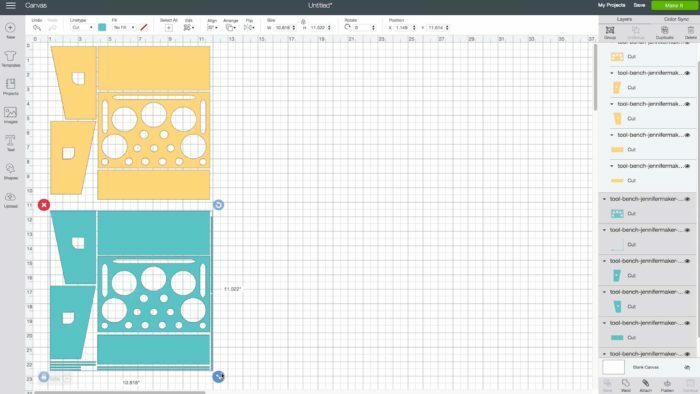 You’ll find my free Cricut Tool Bench pattern in my resource library (you can get a password at the bottom of this post). Note that this pattern is available in SVG, DXF, and PDF formats. You can cut this craft tool bench out by hand with the PDF file or with a cutting machine like a Cricut. If you’re going to cut this gift bow on your cutting machine, upload the file to your design software. If you’re not sure how to download and upload an SVG cut file to Cricut Design Space, watch this helpful video training series I made. If you’re on an iPhone or iPad, here’s how to download and upload SVG files to the Cricut Design Space app. Tip: To get the pattern to fit efficiently on your materials and mats, ungroup everything, then attach all of the yellow layers together and then all of the blue layers together. The yellow layer is your base material (so your Heavy Chipboard or your plain Kraft board) and the blue layer is your decorative covering (so your iron-on glitter vinyl or your foil Kraft board). If you cut heavy chipboard on your Maker, be sure to tape your chipboard to your mat, put in your knife blade, and move your star wheels (those white wheels on your Maker) all the way over to the right side. It took about 45 minutes (20 passes) to cut my heavy chipboard for this Cricut Tool Bench pattern. I recommend you keep an eye on your Maker as it cuts, as it may be done in as little as 10 passes. To check, just pause your machine, lift up a corner, and see if it’s cut all the way through yet or not. When you cut iron-on vinyl, remember to MIRROR your layer in Design Space and then put the glitter itself FACE DOWN (shiny side down) on your cutting mat. I show exactly how to do this in my video. 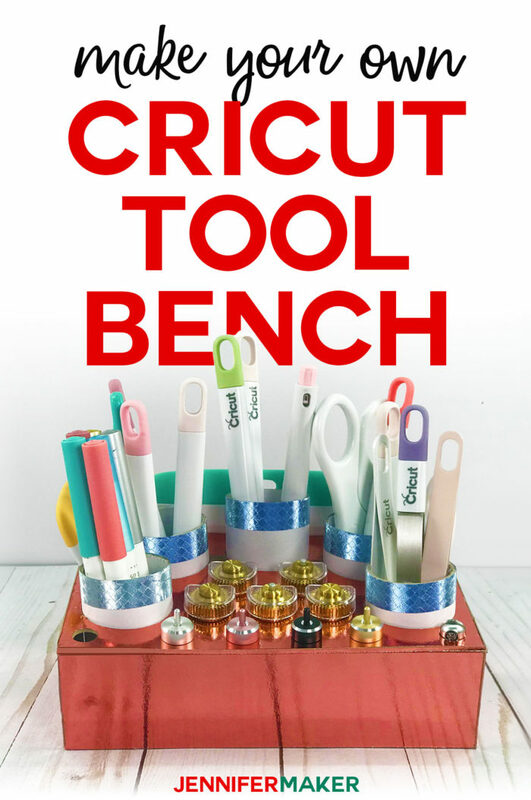 The Kraft board version of my Cricut Tool Bench cut on your Explore (or Maker!) is three layers of Kraft board. One of those layers (the top layer) can be the pretty foil Kraft board like I used for my pink one. Or you can use iron-on glitter vinyl over your three layers of regular Kraft board as I did with my blue one. Your choice! To watch me actually create a Cricut Tool Bench start to finish,check out my video! The Heavy Chipboard board version of my Cricut Tool Bench cut on the Maker is just one layer of heavy chipboard. One of those layers (the top layer) can be the pretty foil Kraft board like I used for my pink one. Or you can use iron-on glitter vinyl over your three layers of regular Kraft board as I did with my blue one. Your choice! To watch me actually create a Cricut Tool Bench start to finish, check out my video! One of the things I just love about these Cricut Tool Benches is how surprisingly sturdy they are. This blue one is rock solid thanks to the heavy chipboard and even the layer of iron-on glitter vinyl seems to help! The pink one gets its strength from the tubes, and you can put a surprising amount of stuff inside. Both can be picked up and moved about without worrying that everything will fall out. I can think of so many fun ways to decorate these. I used glitter and foil, but you could paint them, cover them with washi paper, or adhesive vinyl. You can also make these from some different materials. A couple layers of basswood would work, for example. As would a couple layers of lighter chipboard. Just plain cardstock is not likely to be strong enough, however. Download my free Cricut Tool Bench pattern by subscribing (free) below to get the password to my resource library. I’m hoping to see lots of people make these tool benches AND personalize the panel on the front! 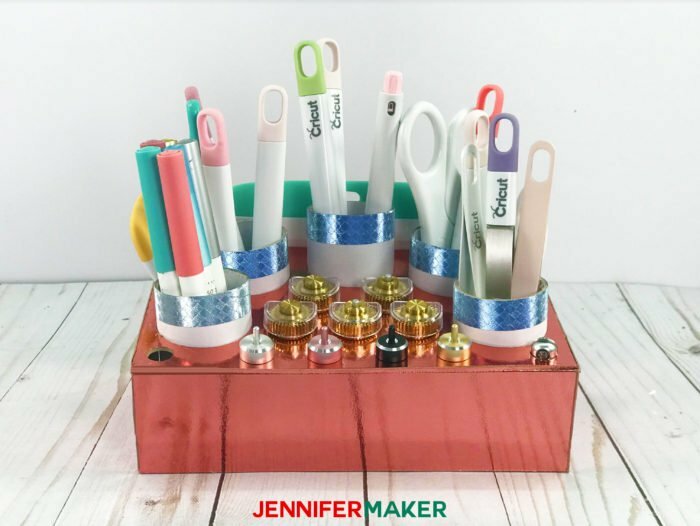 Put your name, some cute pictures, or even just “Cricut Tool Bench!” And be sure to share your photos — I LOVE to see what you make!If you make your own Cricut tool holder, please share a photo in our Amazing Cricut Facebook group, email it to me at [email protected], or tag me on social media with #makershowandtell. Want to remember this? Save the Cricut Tool Holder Step-by-Step Tutorial to Your Favorite DIY Pinterest Board! No, I don’t think so. You can cut Kraft board with an Explore. I did it! I made a cool tool bench on my Maker. If I can figure out how, I’ll post a picture!